Memorial Day, that “holy day” when we commemorate the ultimate sacrifices made by our men and women in uniform for our liberty, is so much more than a picnic, or a weekend getaway. It is a day of reflection for those sacrifices made by so many, that hundreds of millions may enjoy even a modicum of freedom and liberty today. It is a day to pause from the daily grind and celebrate the lives, and even the deaths, of those who have perpetuated this Republic, this One Nation Under God. 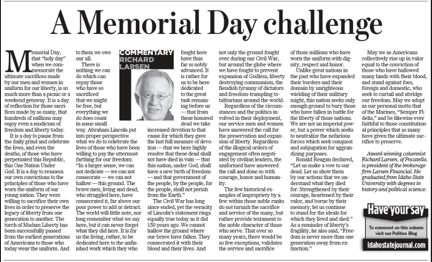 It is a day to reassess our own convictions to the principles that those who have worn the uniform of our young nation were willing to sacrifice their own lives in order to preserve the legacy of liberty from one generation to another. The torch of Madam Liberty has been successfully passed from the earliest generations of Americans to those who yet wear the uniform. And to them we owe our all. The Civil War has long since ended, yet the veracity of Lincoln’s statement rings equally true today as it did 150 years ago. We cannot hallow the ground where our brave have fallen. They consecrated it with their blood and their lives. And not only the ground fought over during our Civil War, but around the globe where we have fought to prevent expansion of Godless, liberty destroying communism, the fiendish tyranny of dictators and freedom-trampling totalitarians around the world. Regardless of the circumstances and the politics involved in their deployment, our service men and women have answered the call for the preservation and expansion of liberty. Regardless of the illogical orders of engagement often negotiated by civilian leaders, the uniformed have answered the call and done so with courage, honor, and humanity. The few historical examples of impropriety by a few within those noble ranks do not tarnish the sacrifice and service of the many, but rather provide testament to the noble character of those who serve. That over so many years, there would be so few exceptions, validates the service and sacrifice of those millions who have worn the uniform with dignity, respect, and honor. Unlike great nations in the past who have expanded their borders and their domain by unrighteous wielding of their military might, this nation seeks only enough ground to bury those who have fallen in battle for the liberty of those nations. We are not an imperial power, but a power which seeks to neutralize the nefarious forces which seek conquest and subjugation for aggrandizing purposes. May we as Americans collectively rise up in valor equal to the conviction of those who have hallowed many lands with their blood, and stand against foes, foreign and domestic, who seek to curtail and abridge our freedom. May we adopt as our personal motto that of the Marines, “Semper Fidelis,” and be likewise ever faithful to those Constitutional principles that so many have given the ultimate sacrifice to preserve.